Motorola announced in 2006 that Pakistan planned the world's largest WiMax roll-out. "The deployment is a milestone in the spread of WiMax, a superfast wireless technology that has a range of up to 30 miles and can deliver broadband at a theoretical maximum of 75 megabits per second. 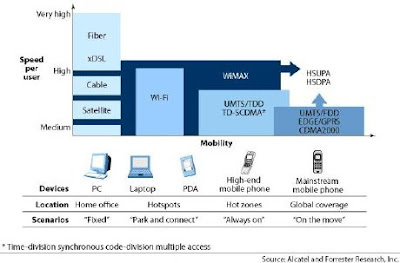 The 802.16-2004 standard, which is used in fixed WiMax networks, is being skipped in favor of a large-scale introduction of 802.16e, which was only recently agreed upon by the WiMax Forum," the 2006 announcement said. Let's examine the state of WiMax deployments and subscriber growth around the world since the Motorola announcement more than two years ago. The broadband wireless access (BWA) industry has grown significantly in the last few years due to increased availability of spectrum for commercial services and the desire to close the digital divide, according to Wimax.com. A major shift from the industry has been the migration towards standards-based products. The largest wireless ISP in the world, Clearwire, has more subscribers than the next four BWA/WiMAX operators combined. The majority of its user base relies on the desktop modem from its former equipment subsidiary, NextNet, which is now part of Motorola's operations. PC Cards and VoIP services are now part of the portfolio. The operator is expected to launch its first commercial WiMAX network (using Motorola's 802.16e-2005 radios) in Portland, Oregon before the end of the year. Regulatory approval to form a joint venture with Sprint Nextel to launch a nationwide WiMAX service in the US is eagerly anticipated. A successful joint venture would catapult Clearwire into a unique position as the only fixed wireless network operator to transition into a mobile carrier. According to Fierce Broadband Wireless, the largest mobile WiMAX deployments reported during first-quarter 2008 were from Korea Telecom with nearly 150,000 subscribers and Wateen Telecom (Pakistan) with more than 10,000 subscribers at the end of that quarter. Wateen is today the largest mobile WiMAX Motorola deployment. In June 2006, Wateen placed an order for 198,000 CPEs from Motorola. Motorola has shipped 60,000 CPEs so far. Wateen has told Fierce that they had 25,000 subscribers by the end of June 2008. The operator expects to complete the order of 198,000 CPEs by this year. It is expected that the gap between mobile "16e" deployments and "16d" will narrow once trials of 16e equipment are complete and certified equipment becomes widely available. The liberalization of Pakistan's telecommunications industry started in 1997 and accelerated under former President Musharraf and former Prime Minister Shaukat Aziz. In 2004, the Pakistan Telecommunications Authority (PTA) introduced two types of licenses for ISPs – regional and nationwide, and also exempted them from Central Excise Duty. Over the past four years, the Pakistani telecom sector has attracted more than USD 5.6 billion in foreign investments. During 2007/08, the Pakistani telecoms sector alone received USD 1.44 billion in Foreign Direct Investment (FDI) – about 30 per cent of the country’s total FDI. The pace of investment is likely to slow down this year because of the global financial woes. Pakistan's network operators are offering wide range of technologies like DSL, Cable, FTTH and WiMax. They have added 25,500 new broadband connections in the financial year 2007-08, which is around 150 percent increase compared to the previous financial year, Pakistan Telecommunication Authority (PTA) statistics reported. At present Digital Subscriber Link (DSL) is the leading broadband service in the county with 65 percent of the market share. Major DSL providers in Pakistan are Micronet, LinkDotNet, CyberNet, MultiNet and PTCL. Wateen is likely to see growing WiMax competition from operators including Wi-Tribe, Mobilink and LinkDotNet in Pakistan. Wi-Tribe is jointly owned by Qatar Telecom, ATTCO group and Clearwire. Motorola has signed a multi-year WiMAX contract with Wi-Tribe. Motorola has commenced deploying Wi-Tribe’s WiMAX network in the 3.5GHz spectrum. Commercial launch is expected during 2009. LinkDotNet, a subsidiary of ORASCOM Telecom, is working with Alcatel-Lucent for their WiMax deployment. According to WiMax.com, Bharti TeleVentures, Reliance, SIFY, BSNL and VSNL (Tata Group) have all acquired licenses in 3.3 GHz range and are in various stages of trials. VSNL has announced Phase 1 pre-WiMAX deployment of Aperto gear in 60 locations, extending to 200 locations within the year. Although there is clearly insufficient spectrum to offer DSL-like service, several operators have indicated that there is still a huge market for 64 and 128 kb/s connections, which should alleviate the lack of spectrum. Once the trials are over, analysts expect WiMax subscribers to grow to about 19m in India by 2012. "The good news is that WiMax appears to work pretty well (no latency or jitter as the KITT car was taking down bad guys), making it a potential competitor to telephone and cable companies' broadband offerings. The bad news is that most American cities may never get post-wired like Portland and Baltimore, the other city now boasting a full-fledged WiMax network." Fortt believes that WiMax, with its ability to serve up broadband on the go, certainly could spark a fresh wave of innovation. The Obama administration's broadband measures in its latest stimulus package should help give a boost to WiMax deployments in the United States. While the potential for Wimax in the US market looks very good, I believe the really big opportunity is in the emerging markets, such as India and Pakistan, where the mobile phone has achieved greater than 50% penetration and the PC/Internet penetration remains in single digits. South Asia is witnessing some of biggest planned deployments of Wimax with a lot of consumer interest in both fixed and mobile broadband. According to Juniper Research, South Asia will be the driving force behind the growth of Mobile WiMax, or the 802.16e standard. The Asia and Australia regions are expected to account for more than 50% of the total WiMax deployments by 2013. Pakistan, being among the first countries in the world to roll-out a functional WiMax service, is experiencing tremendous growth in demand after Wateen Telecom’s launch of its WiMax service and roll-out plans announced by Mobilink. India's state-owned Bharat Sanchar Nigam Limited is rolling out a Wimax network for broadband access in response to government requirement that 20 million broadband lines be in service by 2010. Given the growing demand for the Internet access and the ubiquity of mobile phones, Wimax roll-out will likely spur the largest adoption of mobile Internet in South Asia in not too distant future. In the face of slowing investments due to global financial woes this information on wireless internet access is very encouraging. Thanks so much for sharing! Internet connectivity in Pakistan is as low as 10 percent but opportunities for growth are evident, a team of Google and YouTube officials who visited the country early this month said in a blog post. The main reason of the growth of internet opportunities in the country, according to the team, is low broadband costs which at $13 per month is quite cheap compared to the other parts of the world. Also Smartphone usage is on the rise and there are a growing number of Pakistani developers who are creating mobile applications for sale both in Pakistan and abroad. Since 60 per cent of Pakistanis use mobile phone and pay an average bill around $3 per month and SMS being the primary means of communication, the team noticed a good opportunity of Internet growth in Pakistan. Early this month, the team went to Pakistan to explore business and content opportunities, following up on Google’s Clinton Global Initiative commitment to Pakistan and to sponsor and participate in Pakistan’s first International Youth Conference and Festival. The availability of local Pakistani content online is another reason the team found to make more Pakistanis engaged into internet. For example, the fusion music “Coke Studio”, a music project sponsored by Coke, became popular in YouTube last summer. Since “Coke Studio” brought the pure aroma of popular music culture of Pakistan it gained a special place in the Internet world. It also brought forth the talented Pakistani musicians into light. “The Pakistani media is young and voracious. It was just eight years ago that the government opened up the airwaves to allow non-state media channels to exist, and in that short time the media has grown to become an important player in the public discourse in Pakistan, despite occasional crackdowns from authorities,” said the blog post. The team also said dozens of news organizations have begun to use YouTube as a global distribution platform as well, reaching not only Pakistanis online but the diaspora abroad. Also during the trip the team attended and participated in the International Youth Conference run by an organization called Khudi. Khudi was founded by the dynamic Maajid Nawaz, a former extremist who changed his views towards moderate Islam and has since devoted his life to educating young people on freedom of expression and anti-extremism. “Pakistan’s future no doubt lies with its youth. An incredible 62% of Pakistanis are under the age of 25. In this way we saw an opportunity for technology to not only foster economic development, but also to break down borders in the region,” said the blog post.